During the 1980s and 1990s the Fairmount Park Art Association (now the Association for Public Art) organized a series of benchmark programs with lasting influence on contemporary public art practice. These programs explored links between public art and various disciplines, including architecture, landscape architecture, and urban planning and investigated the pivotal role that public art can play in the design of cities and public spaces. To bridge the gap between public art and ordinary life, the Art Association initiated the pioneering program Form and Function in 1980. The Art Association invited artists to propose public art projects for Philadelphia that would be utilitarian, site-specific, and integral to community life—works that would be integrated into the public context through use as well as placement. Each artist was asked to give meaning or identity to a place, to probe for the genius loci, or the “spirit of the place.” The Art Association’s intention was to respond to the needs of a changing city, as well as to accommodate the expressions of individual artists. The resulting proposals, which ranged from lighting to the design of community parks, expanded the definition of public art in the early 1980s. An exhibition of the proposals as “works in progress” at the Pennsylvania Academy of the Fine Arts encouraged community dialogue. A catalogue of the projects accompanied the exhibition. The first proposed works to be installed (in 1982) were Rafael Ferrer‘s El Gran Teatro de la Luna and Siah Armajani‘s Louis Kahn Lecture Room. Red Grooms’s Philadelphia Cornucopia was carried out that same year as an independent project by the Institute of Contemporary Art. Richard Fleischner’s proposal for the new campus of Community College was thwarted when the site plans were unexpectedly changed, although his concepts were later realized through a fruitful collaboration with Mitchell/Giurgola Architects for the Columbia Subway Plaza. 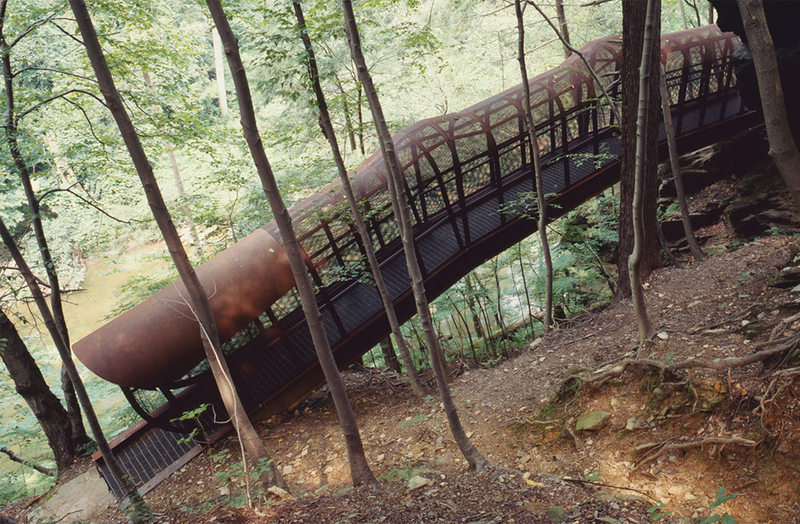 Jody Pinto‘s Triple Tongue Pier was slowly transformed, and the resulting Fingerspan was installed along the Wissahickon Creek in 1987. 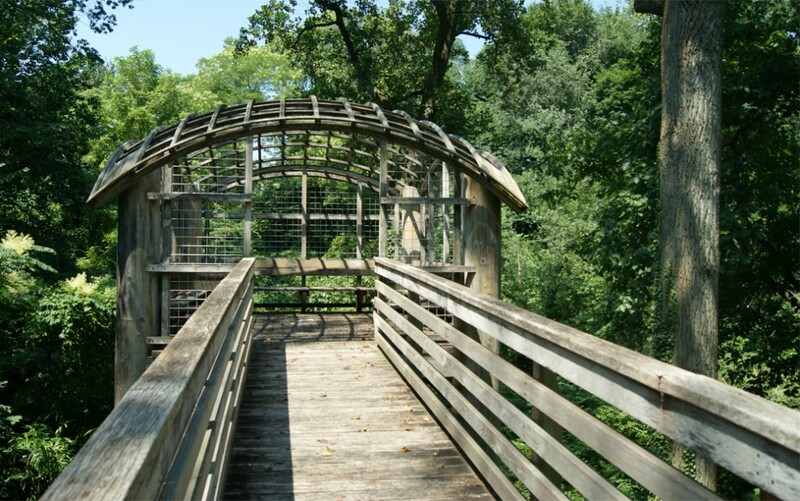 Martin Puryear‘s Pavilion in the Trees was installed in 1993 in Landsdowne Glen, behind the Horticulture Center. Other proposals were submitted by Scott Burton, Dan Flavin, Red Grooms, John Hedjuk, Robert Irwin and Barry Le Va.
Martin Puryear’s Pavilion in the Trees (1993) near the Horticulture Center in West Fairmount Park. Photo Wayne Cozzolino for the Association for Public Art. Martin Puryear’s Pavilion in the Trees is an amenity located near the Horticulture Center in West Fairmount Park. The original model, developed as part of Form and Function, included a steep set of stairs, but the artist decided to substitute a sloping ramp for aesthetic and safety reasons. Puryear—whose retrospective exhibition was shown at the Philadelphia Museum of Art in 1992—worked with architect Samuel Harris at the time with the firm Kieran Timberlake and Harris to realize the project, which was supported by the Pew Charitable Trusts, the National Endowment for the Arts, and the Pennsylvania Council on the Arts. Inspired by the universal childhood longing for a tree house, Pavilion consists of an open structure supported by a series of posts. All of the materials—western red cedar, heart white oak, heart redwood—were selected for their natural durability. 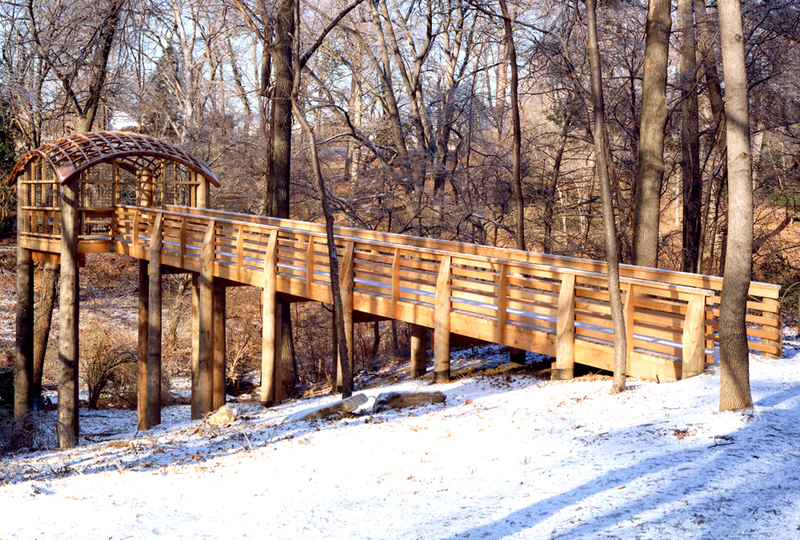 A sixty-foot walkway leads across a natural basin to an observation platform—a square deck covered by a latticed canopy—that rises twenty-four feet above the ground. Situated high among the treetops, the work has become a much-favored place to relax and contemplate nature from a bird’s-eye view. Directions by Car: Exit Rt. 76 at Montgomery Drive and continue west toward Belmont Avenue. Turn left at entrance to the Horticulture Center/Japanese House and Garden. Pavilion in the Trees is in the Lansdowne Glen, behind the Horticulture Center. Jody Pinto’s Fingerspan (1987) in the Wissahickon. Photo Wayne Cozzolino for the Association for Public Art. “It’s one of the most breathtaking points along the Wissahickon,” artist Jody Pinto said of the gorge south of Livezey Dam. A span once served to get people across the gorge; when it deteriorated, the Park Commission retro-fitted and installed a staircase from an old ship. To replace the stairs, Pinto designed Fingerspan, an outgrowth of the Form and Function program. Pinto, born in New York, grew up in a family of artists and photographers. Many of her works use imagery from the human body. “For me,” she says, “the body is the central source of information, of everything we understand, everything we see.” In Fingerspan, her first permanent outdoor installation in the United States, she wanted to link the human body with the natural environment in such a way that viewers themselves, passing through the work, would help to establish the connection. The artist considered issues of safety, security, and durability. The steel covering is perforated with 1/2″ holes to prevent people from falling or climbing over the edge, while allowing a view of the spectacular gorge below. The deck is made of steel bar grating and is designed to sustain a load of 100 pounds per square foot. The entire 18,000-pound construction is made of weathering steel that forms a protective coat of rust when exposed to the elements over time. As a reviewer commented, the bridge looks as if it has been in place since the days of the Lenni Lenape Indians. Samuel Harris of the firm Kieran Timberlake and Harris, who served as architect and engineer for the project, collaborated in developing the concept into a practical structure. The span was fabricated in sections and installed by helicopter. A grant from the Art in Public Places Program of the National Endowment for the Arts supplemented funds from the Fairmount Park Art Association (now the Association for Public Art), and the work was donated to the City of Philadelphia. Directions by Car: Park on Allen’s Lane in Mount Airy, and walk down Livezey Lane to the creek at a point where the dam and Canoe Club are visible. Turn left and follow hiking trail (15–20 minutes) to a small steel foot bridge, and climb stone steps to Fingerspan. Rafael Ferrer’s El Gran Teatro de la Luna (1982; reinstalled 2012) in Fairhill Square. Photo courtesy Office of Arts, Culture and the Creative Economy. Rafael Ferrer, a native of Puerto Rico who moved to Philadelphia in 1966, created El Gran Teatro de la Luna for the Form and Function project. Following a period of time in storage, El Gran Teatro de la Luna was recently restored and repainted by Ferrer for the City of Philadelphia through the Office of Arts, Culture and the Creative Economy, with funding from the NEA and matching support for the artist by the Association for Public Art. The sculpture was reinstalled in 2012 as part of Philadelphia’s Parks & Recreation’s site renovations. The moon is recalled in the wheels and balls used as the acrobats’ props, and it becomes a symbol for the inspiration behind the performance. Observers have seen both joy and frenzy in the postures and the extravagant epoxy colors, which range from red and pink to lavender and chartreuse. In 1999, as part of the Art Association’s New•Land•Marks program, artist Jaime Suárez developed Glorietas of Fairhill Square which incorporated a pavilion that could provide a new base for Ferrer’s work. Siah Armajani’s Louis Kahn Lecture Room (1982) at the Fleisher Art Memorial. Photo © Association for Public Art. For Form and Function, Siah Armajani wanted to create a work for a school. The result was a room dedicated to Louis Kahn that serves as a lecture room and meeting place as well as a gallery for displaying reproductions of Kahn’s architectural drawings. Armajani, an Iranian who emigrated to the United States in 1960, is a principal theorist of contemporary public art. His work has been described as democratic because it brings art into the service of daily life. His bridges, rooms, and garden structures are deceptively simple, meticulously crafted, and often inscribed with passages from his favorite writers, including Emerson, Melville, and Whitman. The Louis Kahn Lecture Room is designed to accommodate about 35 people. 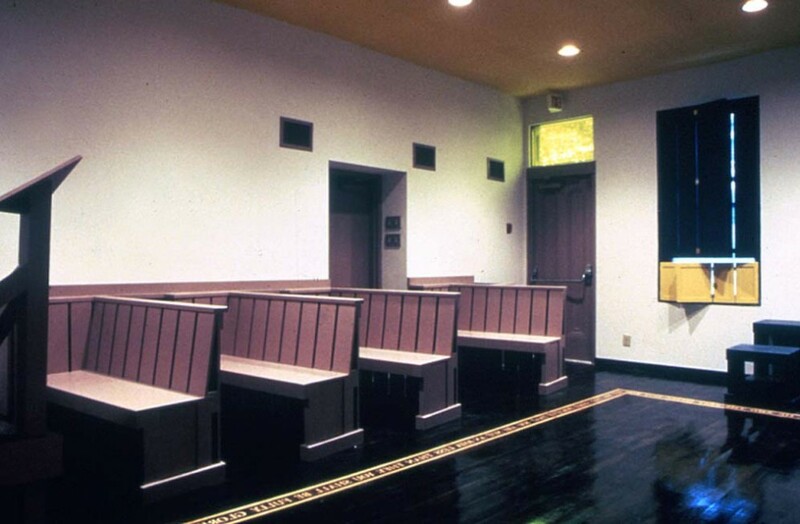 Wooden pew-like benches extend at an angle from the walls. In the middle of the room, Armajani left enough open space to allow a “meditative quality.” The durable hardwoods are painted in grayish rose, bright yellow, and Pennsylvania Dutch blue. At the entrance a glass transom has one of Kahn’s designs etched in it, and display surfaces on the walls offer changing examples of his work. Mounted on the cornice are quotations from Kahn, one of which reads: “Schools began with a man under a tree who did not know he was a teacher, sharing his realization with a few others who did not know they were students.” An inlaid wooden rectangle in the floor bears a verse by Whitman that begins: “When the materials are prepared and ready, the architects shall appear.” The room’s simple elegance suggests a Quaker meetinghouse or a country church. In fact, Armajani intended to evoke the feeling of the adjacent Sanctuary, which was originally built as a church. The Samuel S. Fleisher Art Memorial is the nation’s first tuition-free art school. Fleisher, with support from the city’s Office of Housing and Community Development, funded the building renovation and lighting; the Fairmount Park Art Association (now the Association for Public Art) sponsored the room’s design and installation. For access to the Louis Kahn Lecture Room, call (215) 922-3456. Directions by Car: From Center City Philadelphia, take 6th Street south to Catharine Street. Turn right onto Catharine Street. The Fleisher Art Memorial is on the right side, between 7th and 8th Streets. Left: The Association for Public Art commissioned this 1981 Sol LeWitt proposal for Lines in Four Directions in Flowers, realized in 2012 (pictured right) by the Philadelphia Museum of Art. The Association for Public Art has a long-standing history of partnering with the institutions along the Parkway. In 2012 the Philadelphia Museum of Art along with OLIN architects and designers brought to life Sol LeWitt’s Lines in Four Directions in Flowers, 30 years after the Association for Public Art (then the Fairmount Park Art Association) originally commissioned the work in 1981 as part of its Form and Function program. The garden was installed behind the Philadelphia Museum of Art in the William M. Reilly Memorial as the artist had intended and deinstalled in 2015. 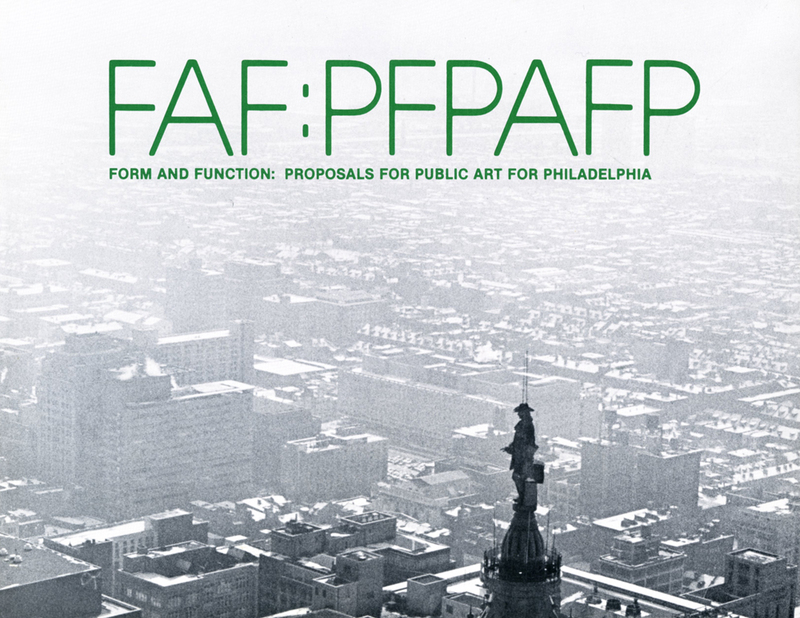 A catalogue for the landmark exhibition Form and Function at the Pennsylvania Academy of the Fine Arts in 1982, this publication features public art proposals from fourteen artists, including Siah Armajani, Rafael Ferrer, Jody Pinto, and Martin Puryear. The aim was to design new works of public art that would be utilitarian, site-specific, and integral to community life in Philadelphia. The catalogue contains illustrated proposal descriptions and an introductory essay by Penny Balkin Bach. The Pennsylvania Academy of the Fine Arts and the Fairmount Park Art Association (now Association for Public Art), Philadelphia, 1982. El Gran Teatro de la Luna (1982; reinstalled 2012) by artist Rafael Ferrer. Photo courtesy Office of Arts, Culture and the Creative Economy. Fingerspan (1987) by artist Jody Pinto. Photo Wayne Cozzolino for the Association for Public Art. Pavilion in the Trees (1993) by artist Martin Puryear. Photo Caitlin Martin for the Association for Public Art. The Louis Kahn Lecture Room by artist Siah Armajani. Photo © Association for Public Art. The Association for Public Art commissioned this 1981 Sol LeWitt proposal (pictured left) for Lines in Four Directions in Flowers, realized in 2012 (pictured right) by the Philadelphia Museum of Art.